OSWEGO – It began in July 1990 with a broken-down 1982 Dodge 400 in the parking lot of the former P&C grocery store at the east end of the JC Penny’s Plaza in Oswego. It continued with a specially-equipped 2017 Chevy Silverado. Scriba resident Karen Butchko had relocated from New Jersey in 1978 and had recently moved to the Oswego area. Don Nichols was the mechanic who responded to her distress call that day. A romance grew from that chance meeting. He proposed on Christmas Day 1995. The couple exchanged wedding vows in the P&C parking lot on June 1, 1996. “’Well, that is just a part of getting old,’ we were told. ‘We all get brain atrophy as we age,’” she told Oswego County Today. However, by 2015, Don was no longer able to write his name. What was next was a series of health issues. Karen would transfer him from his wheelchair to the bed or chair and even in and out of the car in order to get him to and from his many doctor appointments. “That was all we could do, until the day I was unable to move him on my own,” she said. Eventually, Don could no longer talk. It started with slurred speech. “I learned to understand his words and would interpret to others who tried to speak to him (family members, friends and most importantly doctors),” Karen said. “Although we laughed every day as I told him stories or sang to him or danced in his wheelchair – we were both being held hostage by this thing now called ‘dementia,’” Karen said. “In 2017, I found our lifeline to the world. 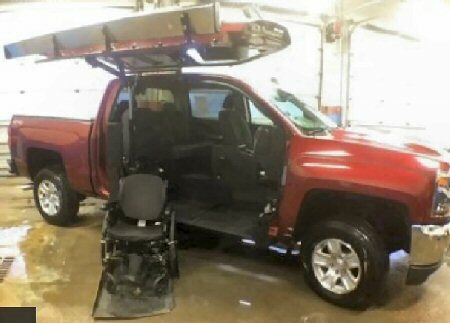 This truck (with wheelchair lift) gave us the ability to come and go as we pleased; going to the doctor, the grocery store or even a walk in the park with our dog,” she said. In summer, they found all the ice cream stands, one by one, on their way home from appointments. “We always got the smallest size dish, but it was usually melted before we could finish it,” Karen said. Don died January 22, 2019, in Oswego Hospital. He was 78 years old. Karen stopped driving the truck to avoid the chance of damage throughout the rest of the Oswego winter and now with less than 5,000 miles on the odometer, the truck has a long life ahead of it. The truck is at Burritts Auto on Route 104 in Oswego. Burritts has listed it on two websites, their own and the GMC auction website. Her plan is to sell the Silverado and satisfy the loan. I won’t make any money on the sale, whether it is auctioned or sold to a private buyer,” she explained. “This life-altering vehicle can mean hope and freedom to a new family isolated or trapped by their health issues,” she added. “I am hoping this article gets people talking and the one person who is looking to regain their freedom can get back out in the world and eat at the ice cream stand anytime, anywhere,” she said. Karen that is so nice about the truck..I’m a single mom ..my son ed is in a wheelchair…we take a bus to doctor appointments ex. I have a brother who had a double amputation a little over a year. He also has heart problems.